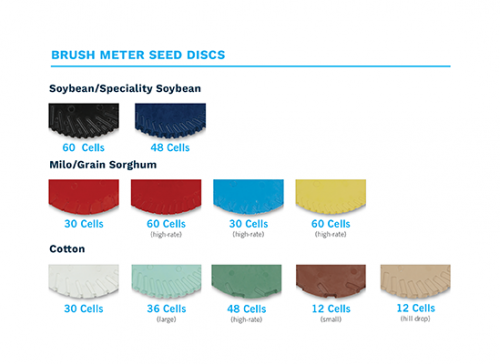 Which Seed Meter Is Right For You? It used to be, when farmers went to the field to plant, the planting monitor on the tractor was equipped with simple indicator lights. These lights showed whether or not seeds were actually getting to the ground. If a seed tube became plugged, a monitor alarm would sound and the problem could be solved. This technology helped, but it was limited. It only enabled the farmer to monitor activity, without actually measuring anything. During the late 1990s and mid-2000s, significant improvements were made to tube sensors and monitors. For the first time, real-time data was being delivered to the farmer so that corrections to seed population could be quicker and easier. Singulation—how well the meter drops seeds one by one—was introduced. Accuracy percentage, measured in real time, took into account the number of skips and doubles. Today, planting speeds have increased. There are more irregular seeds and shapes as well as higher plant populations. Meters must singulate seed almost perfectly and deliver consistent spacing between seeds for optimal emergence. 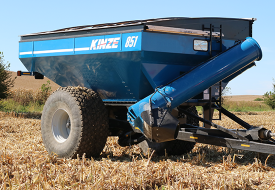 Kinze offers a selection of seed meters enabling farmers to plant different crops, seed sizes and populations with consistent precision and accuracy. 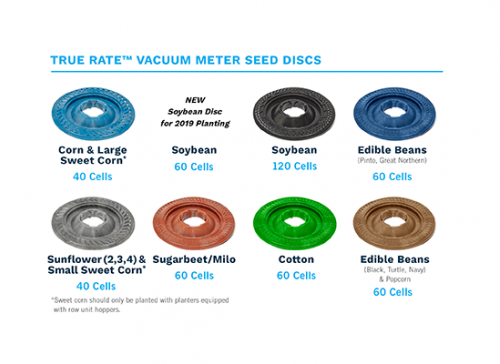 The Kinze True RateTM Vacuum Meter features one easy to adjust seed singulator for all seed types resulting in better than 99% accuracy at speeds up to 8 MPH. * The seed channel design helps ensure every seed cell is loaded helping to prevent skips. 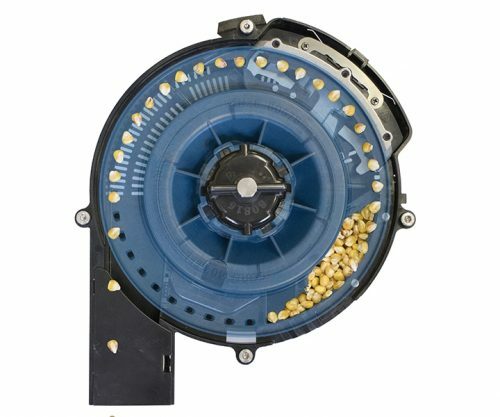 The smaller diameter of the seed disc reduces rpm and a lower velocity at release point means less seed bounce in the tube. The Finger Pick-Up Meter features a brush and seed bump design for corn and sunflowers to provide improved seed singulation. 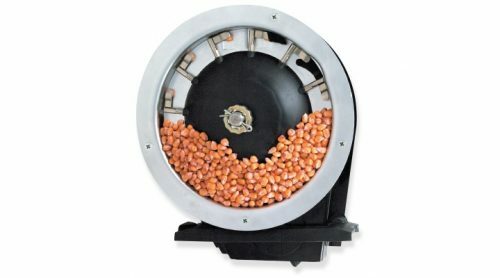 Improved precision-formed, spring-loaded cam-operated fingers handle a wider variety of seed sizes and shapes. 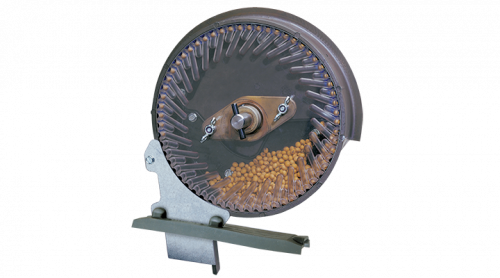 A specially designed seed release opening in the finger wheel plate prevents bounce-back when seed is delivered to the conveyor belt. 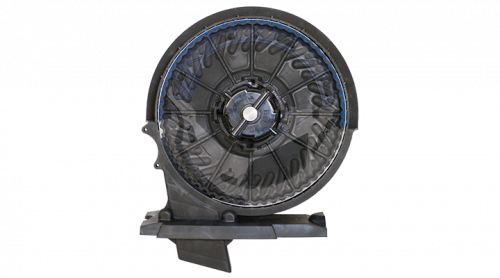 A molded rubber shank cover shields seed sensors from dust and sunlight. Originally introduced in 1990, this is the meter that revolutionized soybean planting by singulating every seed. The dependable, low-maintenance design provides accurate singulation of soybeans, milo/grain sorghum and cotton with only one moving part. It features easy-to-replace, long life brushes and an easy-to-clean design for acres of hassle free planting. 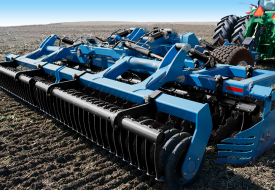 Based on the proven success of the Kinze Brush Meter, the Brush Meter 2.0 provides a low-maintenance system with excellent population control for soybeans, milo/grain sorghum and wheat planting. It has only one-moving part and is easy to clean, operate and maintain. 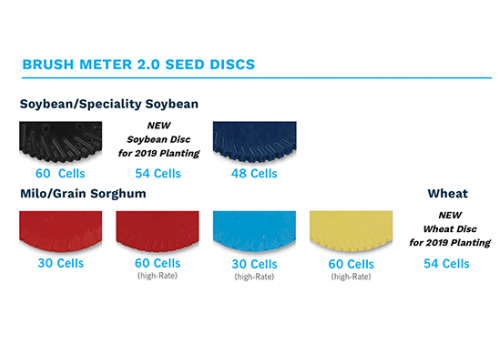 The new design, available for planting 2019 on the 3600 planter only, requires no tools to change out the seed disc or the easy-to-clip-in brushes. The long life brushes are low maintenance and low cost and can be replaced in seconds. 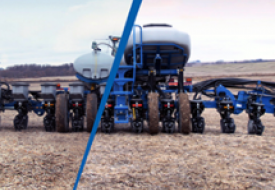 Meter options are available on the complete Kinze planter line-up. 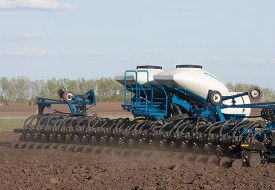 To find the right planter configuration for your operation, contact your local Kinze dealer. 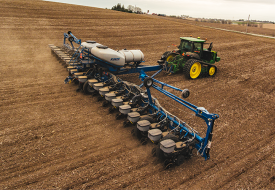 *Speed and accuracy of the planter may be limited by field conditions, seed type and other variables.